This little blog will be celebrating a birthday of its own next month. While Jill and I have been busy tending to our little human kids, Kunik and Oma (no, not their real names), we’ve also been plotting behind the scenes to bring you all sorts of new cheese deliciousness. Stay tuned! And in the meantime, tell us what cheese would you celebrate a birthday with? P.S. Speaking of celebrations, Thursday, October 28, is Champagne Day. There will be tastings at Alexandria’s Whole Foods here in VA, elsewhere follow the hashtag #Champagne on twitter to join in virtually. I ate this week at a fairly new restaurant in DC, Art and Soul, helmed by Chef Art Smith. A Southern-bred, James Beard award-winning chef who came to Washington by way of Chicago — and formerly cooked for Oprah –, Chef Art has a menu that highlights local, seasonal ingredients. Sure, many restaurants profess to do the same, with varying degrees of success, but what impressed me here was seeing the “eat local” philosophy carried over to the cheese menu. 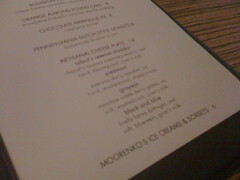 Sadly, we didn’t actually sample the cheese this time as it was not on the Kids’ Restaurant Week prix fixe menu (boo! ), but the list is familiar to any DC-area cheese fan: Talbot’s Reserve from Chapel’s Country Creamery (MD), Everona Dairy’s Piedmont (VA), Meadow Creek Dairy’s Grayson (VA), and Firefly Farms’ Black and Blue (MD) — all fine choices! elsewhere in cheese this week …. Check out Madame Fromage‘s sheep’s milk blue discovery; and, It’s Not You, It’s Brie describes a cheese with “more texture and flavor variations than Mariah Carey has pink stilettos.” Click over to check them out! While Jill has been faithfully working her way through the “100 Great Cheeses” list, I have to confess to having strayed off course. The brief glimpses of warmer weather, in between DC’s recent monsoons, turned my thoughts to fresh local goats and I’ve undertaken a brief dalliance to journey coast to coast in a quest for some fresh farmstead cheese. These local goat cheeses, whether in fresh chevre form or lightly aged, are generally available in limited quantities and often don’t travel as far beyond their farm, making them ineligible for the Wine Spectator list. But we would be doing a disservice to you, dear readers, if we didn’t devote a little time to the best cheeses currently in season. Goat cheese has a season, you ask? Yes, indeed. Goats give birth in the spring, after all, meaning those early months of the year are when goats are producing milk. Coincidentally, that is when fresh green grasses on which goats graze are just sprouting, full of flavor that passes on through the milk and into that dollop of chevre atop your beet salad or asparagus pasta. 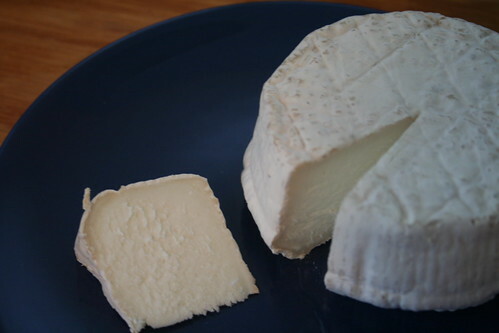 As spring turns to summer, that peak grassy flavor mellows in bloomy-rind, slightly-aged goats milk cheeses, such as the two Maryland cheeses I’ve recently enjoyed from Spriggs Delight and Firefly Farms. I’m a sucker for a cute kid’s face, human or goat, so I couldn’t pass up the new Spriggs Delight Farm offering at Cheesetique. Spriggs Delight is a mother-son operation in Sharpsburg, Maryland, who have been producing cheese for only a few years. This crumpled bloomy-rind round maintains a strong tangy, grassy goat flavor, and was well matched with some fruit-studded crackers that provided a little sweetness to contrast the almost tart taste of the cheese. I’ve been a fan of Firefly Farm‘s manchego-style Cabra LaMancha for some time, but it had been a while since I last sampled their award-winning Merry Goat Round, until getting reacquainted this past weekend at La Fromagerie’s “meet the cheesemaker” event. Firefly Farms‘ cheesemakers have recently moved away from managing goats themselves, instead purchasing all their milk from local Amish farmers who raise the goats on organic feed to Firefly’s specifications. During the warm months, the goats graze on wild grasses of the Allegheny plains of northwestern Maryland/southwestern Pennsylvania. Firefly is instead putting all their attention into perfecting their cheesemaking, and building a larger creamery that will double their capacity later this year. Firefly also gave up their organic certification given the expense of paying for hard-to-find certifiers to visit every six months, but continues to follow organic practices. Their Merry Goat Round is a bloomy-rind, Camembert-style cheese that is aged just three weeks. It has a remarkably clean, fresh flavor and a chalky, firm bite. As it ripens, it develops that soft gooey edge inside the rind but maintains the chalkiness in the middle. 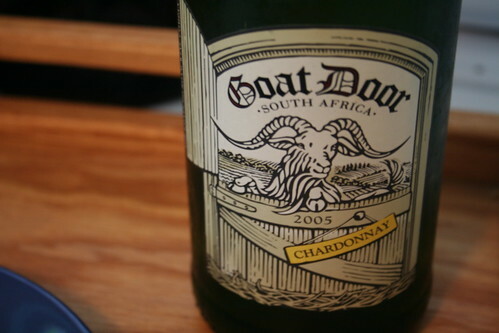 It is slightly sweet and surprisingly mild, with less of that goaty tang present in the Spriggs Delight cheese. Stay tuned for some more “Local Goats” from around the country this week! 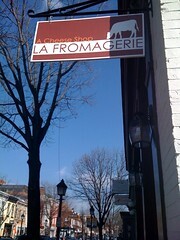 This spring, a new cheese shop opened on the main street of Old Town Alexandria, Va. That makes two cheese-dedicated shops each precisely 1.1 miles from my home, plus several cheese-stocking gourmet shops, which makes this cheesewriter one happy clam. Or curd, I guess you could say. Despite its French name and inspiration — co-owner Sebastien Tavel is a native of the Rhone region — La Fromagerie specializes in high quality, local and domestic artisanal cheeses. A blackboard behind the sales counter proudly proclaims their support for several cheesemakers in the Chesapeake Bay region, including Everona Dairy (VA), Firefly Farms (MD) and Keswick Creamery (PA). While they have a handful of your old European mainstays, Roquefort and the like, this is not the place to go with narrow-minded intentions of obtaining a specific Alpine cheese or brand of Robiola. Rather, this is the perfect shop to spend some time letting Sebastien and his wife Mary fill you in on their latest find. They offer domestic prosciutto and charcuterie from La Quercia (Iowa) and Salumeria Biellese (NYC), fresh, local glass-jarred milk, butter and yogurt (from Trickling Springs and Blue Ridge Dairies) and a carefully chosen wine and beer selection. They’re also planning to host classes in the near future. And with drier summer days finally in sight (perhaps? ), call in an order for a local cheese and Virginia country ham picnic basket and stroll down to the waterfront for a romantic cheese lovers’ tryst. This Saturday, June 6, La Fromagerie will host Firefly Farms’ cheesemakers for a special meet-the-cheesemaker tasting from 4 to 7 pm, and they are having a sale on burger-ready bleu cheeses through the weekend. Visit the website for more details, or stop by the upper King Street shop en route to the water taxi if you’re headed to the National Harbor Food & Wine Festival.